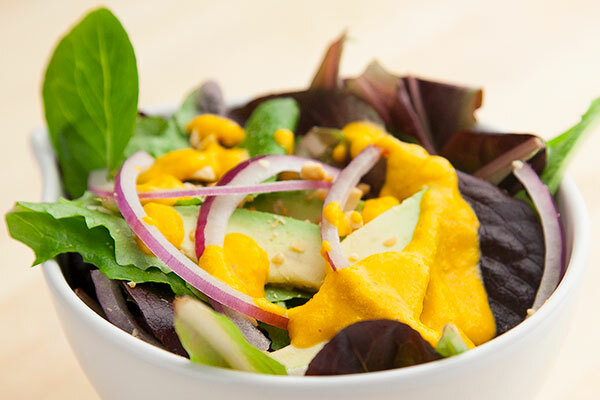 This peanut butter carrot ginger dressing gets a hint of sweetness from The Bee’s Knees peanut butter that balances well with the zest of the ginger. Served on a bed of mixed greens with crunchy sliced red onion and creamy avocado you get a salad with lots of texture and taste. 1. Combine all ingredients in a blender or small bowl of a food processor, and puree until smooth. 2. Taste and adjust seasoning. 3. Drizzle over salad greens before serving. The post VIDEO RECIPE: Peanut Butter Carrot Ginger Salad Dressing appeared first on - Peanut Butter & Co. Recipe Blog.